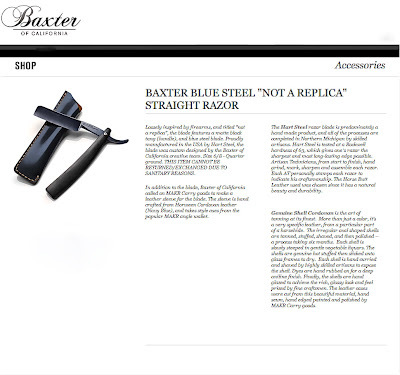 Leave it to the fine folks at Baxter of California to create the straight razor for the quintessential gentlemen of the new millennium. I caught this in The Moment column of today's New York Times. 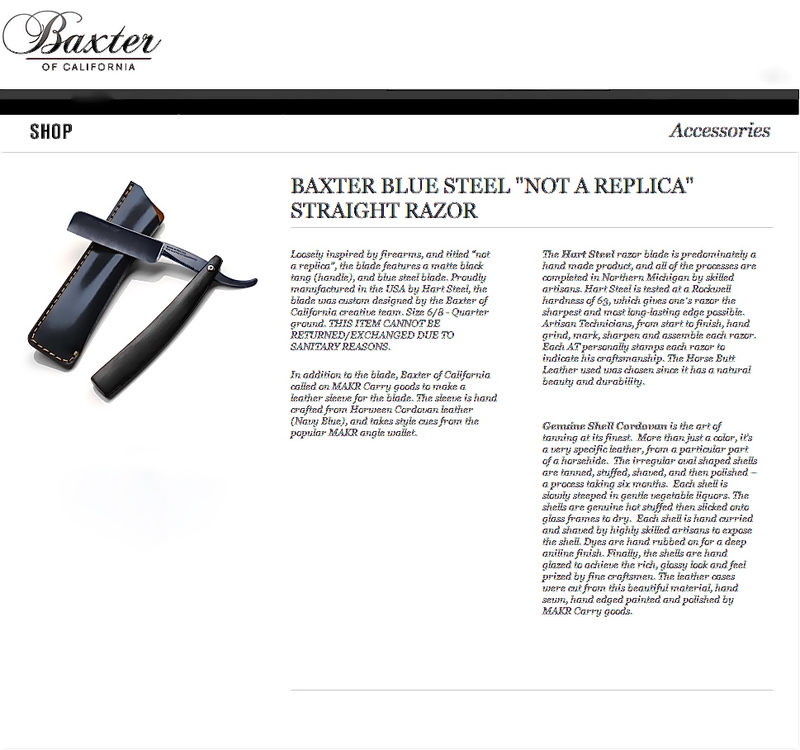 I have visited the Baxter Finley Barber & Shop in Los Angeles (November 9, 2010), but, after seeing this blurb it got me to thinking, how could I treat myself to this unique experience at home. So I spent the morning of this brisk Boxing Day doing a little research and here's what I learned. 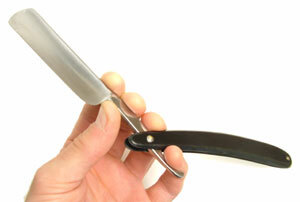 The straight razor shave is a delicate and risky procedure. Be very focused and careful. Now that we've got that out of the way, here's how it goes. First, apply a super thick layer of shaving cream to your face. Never let the cream dry or thin and don't be afraid to keep reapplying cream as needed to keep the lather thick and fresh. 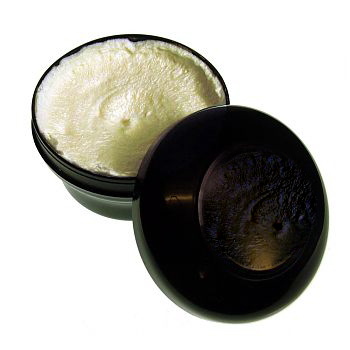 Do not use any creams or gels that come in a can. These products do not lubricate your skin enough for what lies ahead. Always use mug shaving soap and a well-maintained badger-hair shaving brush. If you are going to go to the expense and effort of purchasing a good straight razor, be sure and invest in a leather strop as well. The safest razor for shaving is a sharp razor. A dull razor can pull or snag the skin. Razor burn is often the result of a a dull razor. Sharpening, or stropping, the razor consists of running the edge of the razor in a perpendicular orientation against the strop. 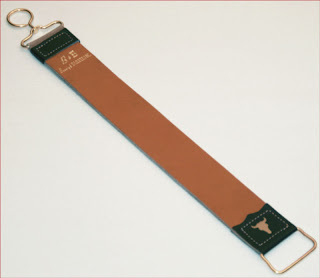 The strop should be as taut as possible. Pull the razor's blade away from you, with the blade facing you, and then back towards you,with the blade facing away from you. Repeat this a minimum of 15 times before each shave. To hold a straight razor, place the pads of your index and second fingers over the metal part that connects the blade to the handle (the shank). Your thumb should wrap under the bottom of the shank so you can grip it. Rest your pinky on the small swooping piece that extends from the handle. On each of your two to three passes, you will start with short strokes and finish off with longer ones. Stretch the skin of the area you're about to shave so it's taut and place the razor at a 20 to 30 degree angle to the surface. Shave with the grain of your hair as you go over it for the first time. This is the optimum time to shave your mustache area, as there is no safe way to shave your upper lip, other than down and away from the nostrils. Apply another thick layer of cream for the second pass. 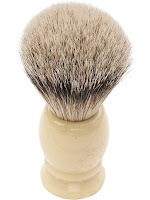 Again shave with the grain, or if you are feeling comfortable with the experience, try shaving sideways to the grain. Keep to the sides of your face and jaw line for this pass. Third time's a charm if you feel up to it. This final pass can go against the grain. This is the most dangerous part of your shave and when most accidents occur so be careful. If you are going to shave your sideburns, remember how close the razor will be to your earlobes and be very careful in the awkward nooks around the neck area. For those of you with heavy beards, it would probably be a good idea to strop your razor before this third pass. Rinse the lather off of your face with cold water. This will close the pores in your skin. Dry the razor. Run a square of toilet paper between the scales of the handle to remove any excess water. Rinse the brush, shake it dry and suspend it upside down until the next shave. That's it. Good luck, gents.